There’s the spontaneous book binge. The I-was-just-passing-and-just-couldn’t-resist kind. This wasn’t one of those. 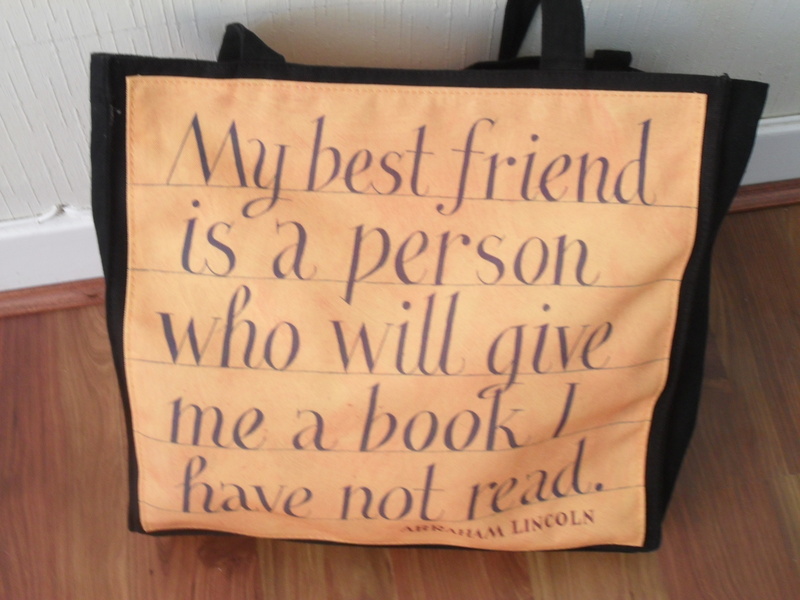 As I’m normally 20 miles from the nearest bookshop, finding myself in central London on a Saturday with an empty bookbag …..
meant that on this day I had every intention of being my own very, very, very best friend! The route was mapped out with military precision. I was staying just off the corner of Old Brompton Road /Gloucester Road. So it was just a three-minute walk to the tube and one stop to Sloane Square. A 40-minute walk later (it should only have taken 5 minutes but I turned right instead of left) and I arrived at Haus Publishing on Cadogan Place. An email earlier in the week told me that the timing of my trip was immaculate. It was the weekend before their refurbishment and there was 50% off every item in the shop! Haus specialise in travel books and foreign fiction, lots of it translated from German. Alongside their own imprint, you can find titles from Pushkin Press, Bitter Lemon Press and Peirene Press. The shop proved to be the cosy little nook I’d always imagined. And yes, I was like the proverbial child in the sweetie shop, though with a modicum of control. For every book I did buy, I left at least one behind on the shelves. After that it was time to take a long walk down King’s Road. A first for me; an idea implanted by Badaude’s quirky London Walks! 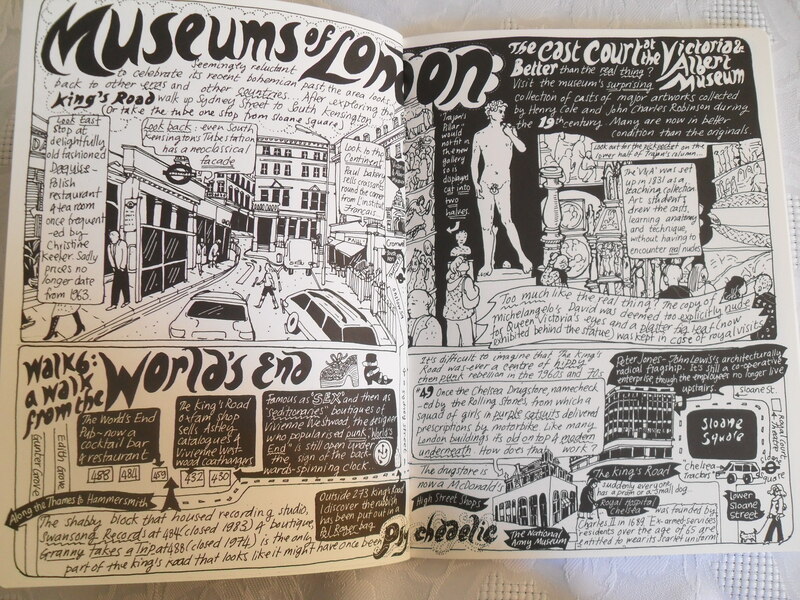 From Sloane Square to World’s End. I didn’t realise at the time that it equated to 1.5 miles from Book Haus; more like 3 miles once I’d turned left instead of right, meandered through a bit of window shopping and market browsing. Still there was a lovely surprise for a bookworm at the end of it. 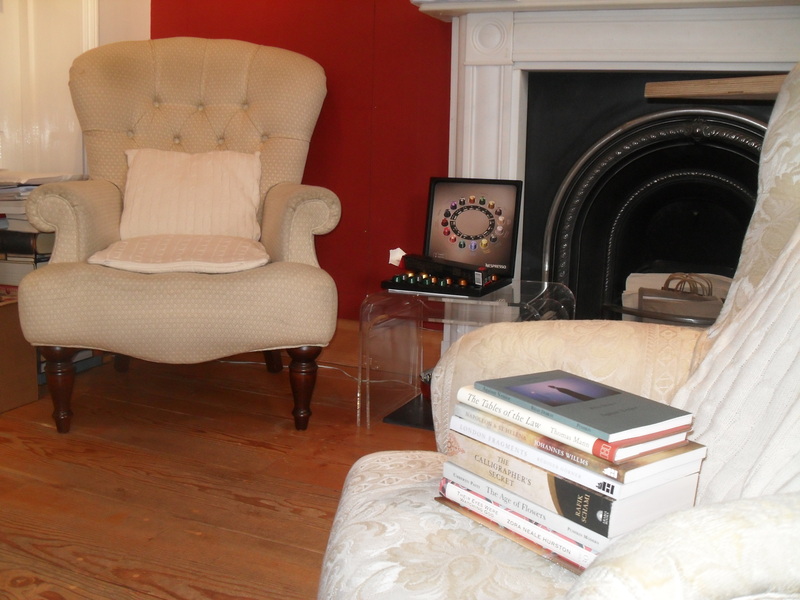 Full of hardback first editions and shelves full of Folio Society volumes. 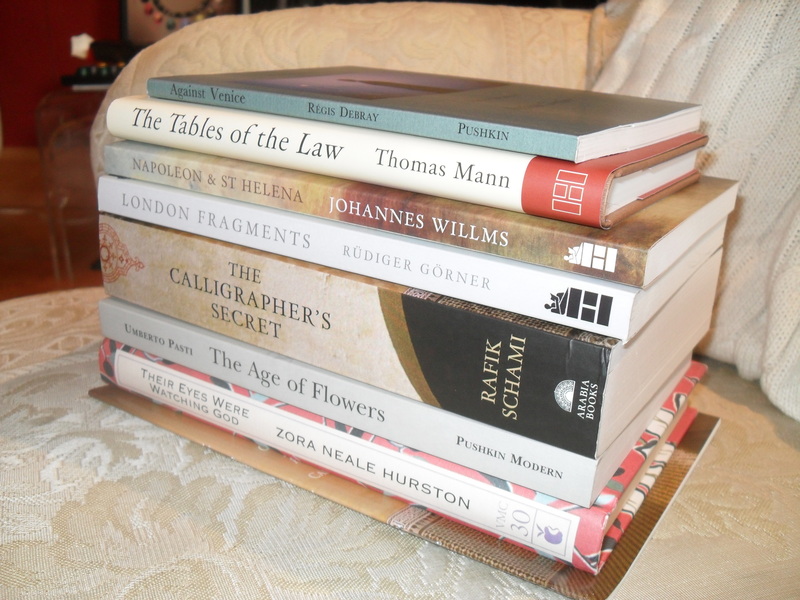 I beat a hasty retreat before my credit card took an unscheduled bashing. and arrived at my destination, at the top end of the market, minutes before the heavens opened and the rain became torrential. 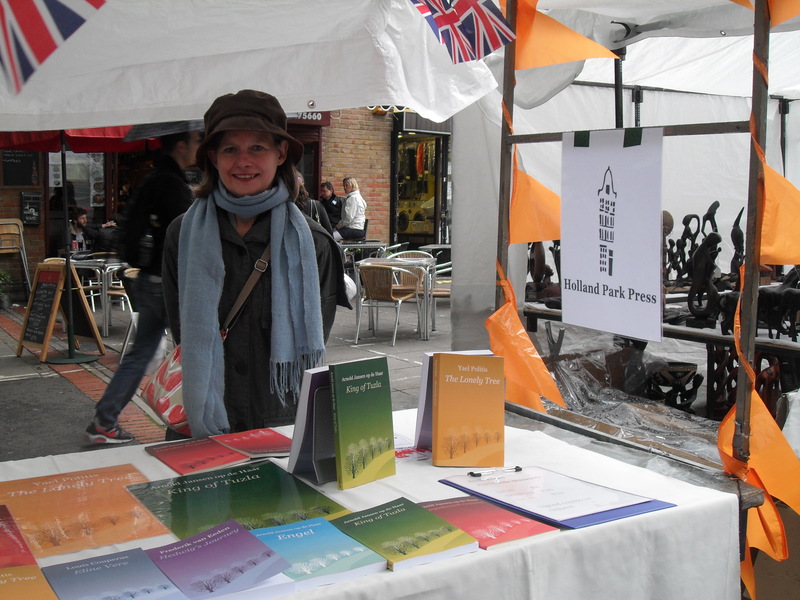 Meet Bernadette from Holland Park Books, a small print specialising in publishing Dutch literature either in Dutch or English translation. Bernadette “mans” a stall on Portobello Market. The aim is to get her brand known through rain, hail or shine. I asked her about the decision to publish the books with uniform covers. It’s to reinforce the brand. The drawing of the path through the trees not only evocative of Holland Park itself but also of the journey that one takes when reading. On that note, I popped Hedwig’s Journey into the book bag. 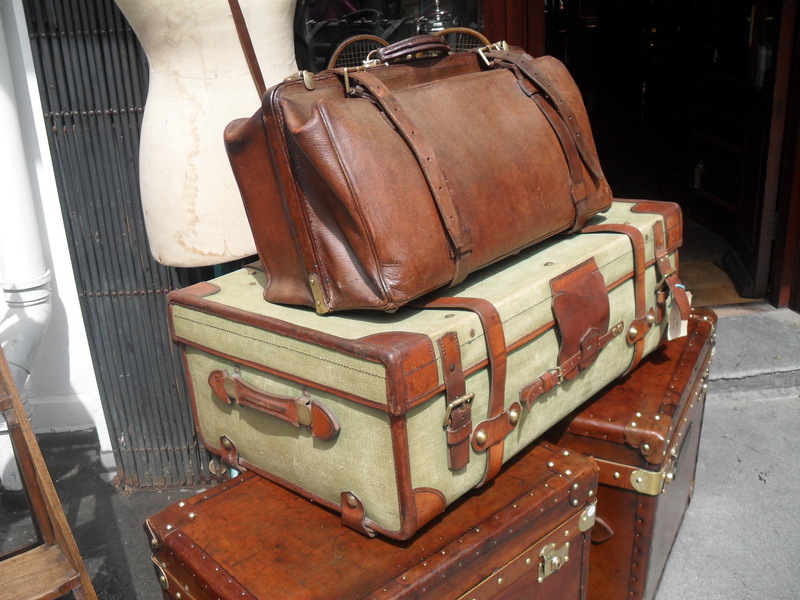 Walking back down the market, I left the suitcases where they were. (I’d only have filled them.) Time now to pop into the Notting Hill Book Exchange – an Aladdin’s cave of good quality second hand books and a favourite haunt of many a London book blogger. By this point I was flagging and in need of fuel, so I limited myself to a quick scout for something by Patrick Hamilton. Nothing there. Made note to self: come back here when you have more time. After some refreshment, back onto the buses. Numbers 328 and 17 returned me to Gloucester Road. 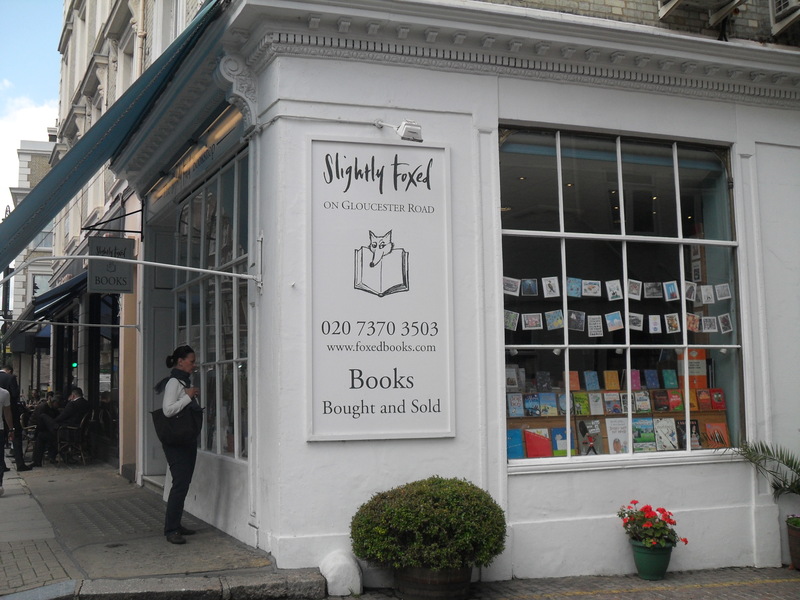 Walking back towards the hotel brought me to the famous Simply Foxed, publisher of the eponymous quarterly and stockist of both new and second hand books. I drew another blank on Patrick Hamilton and was on my way out with only a copy of said quarterly when from the corner of my eye I spotted a literary critique of Rilke. More on why that came home with me some time soon but as I picked that off the shelf, I then caught sight of the NYRB classic Stoner by John Williams. Not a bad word has been written about that on any blog that I’ve seen. So I popped that into the bag as well. It was now 15:30. I had been on my expedition for 6.5 hours. The bag of booty, surprisingly not yet full, was getting heavy and the rain kept on coming. It was time to return to the hotel for a rest and a read. Staying in Kensington and travelling around on the top decks of the London buses, I was taking my cue from my fictional companion for this trip, Mrs Hawkins, the protagonist in Muriel Spark’s A Far Cry From Kensington. After a couple of hours respite, Mrs Hawkins was eager to ride on another bus. By the time Mrs Hawkins and I got back to the hotel courtesy of the Piccadilly line from Covent Garden to Gloucester Road, the pedometer had its own story to tell – 34090 steps or 13.29 miles! Thank goodness that the morrow was scheduled to be a sitting-down day. You really made a day of it, didn’t you? :) And I’m so glad you got Badaude’s book! Lovely post! oh sounds like a lovely day. i am looking forward to your opinion on that rudiger goerner book. That may have to wait until my next London trip. Whenever that is, Rudiger Goerner will be my guide. Sounds like a fun day. I miss living in London. 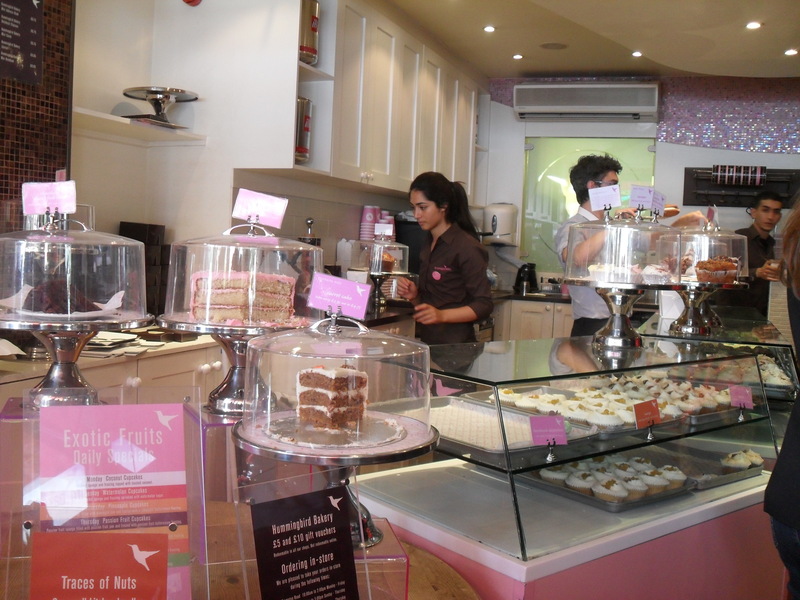 On my next London trip I need to visit Simply Foxed. 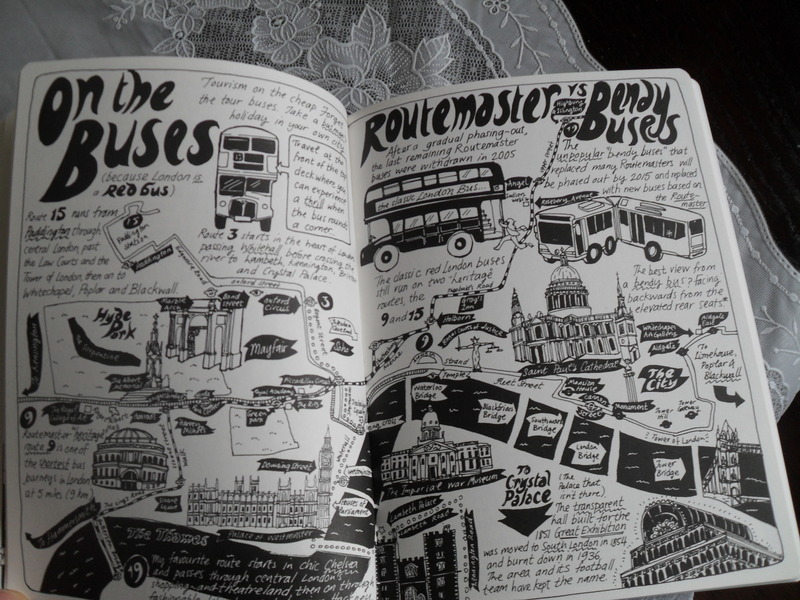 I just read When We Were Orphans and in it there’s also a character who loves to go around London on the top of buses. Another thing I must try. Did you see any shows? 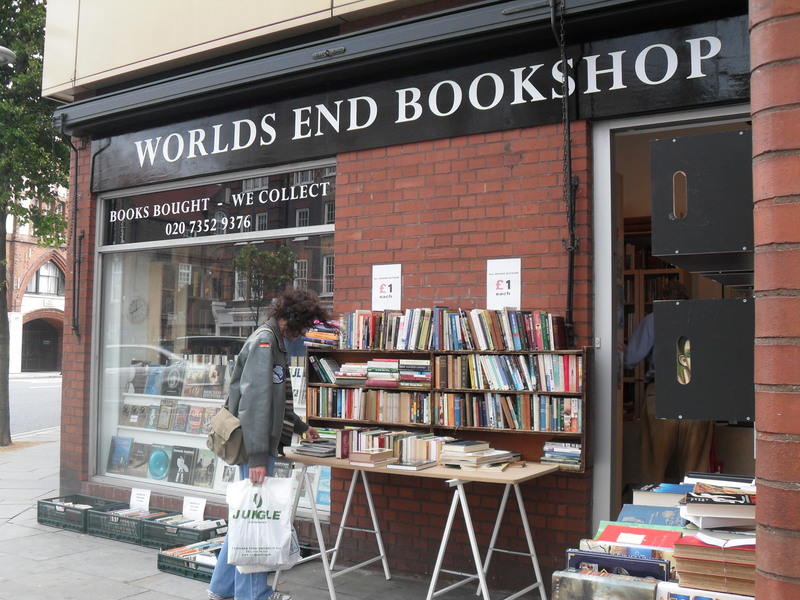 Next time you must come to England’s Lane Books – we are a friendly indy shop in NW3…I found your blog through Boyd’s Restless which I chose for our book group book for this month. I’ll definitely be back to check out your blog again.